You are not alone. Cancer is a major concern for people. In Ireland an average of 30,000 new cases of cancer are diagnosed each year. The number is expected to rise to over 40,000 per year by 2020. The five most common cancers in Ireland are non melanoma skin cancer (the most common and treatable form of skin cancer), prostate cancer, breast cancer, bowel cancer and lung cancer. 42% of men and 50% of women diagnosed with cancer currently survive for five years and longer. It is estimated that 280,000 people, diagnosed between 1995-2009, have survived their cancer. Cancer has many causes but we know that some of these causes are preventable. 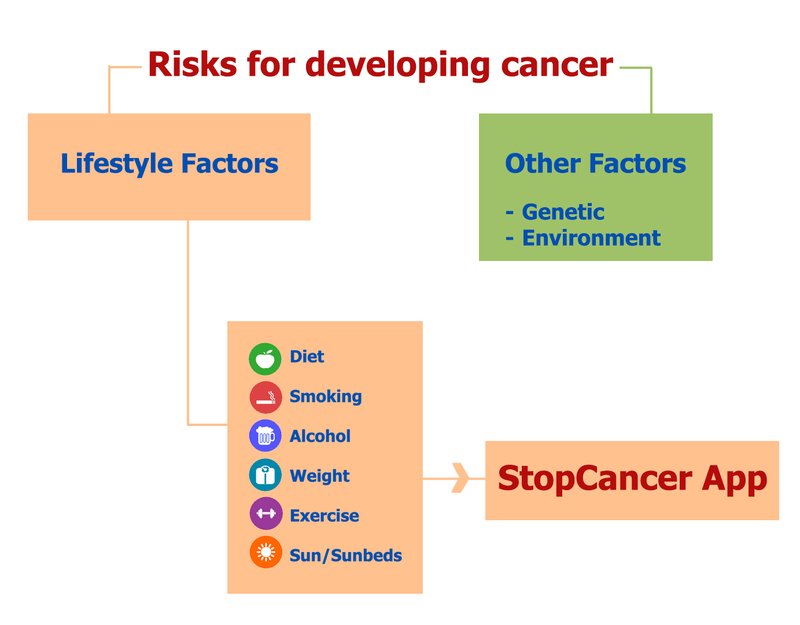 What can I do to reduce my risk of developing cancer? Your lifestyle can be altered or changed to reduce your risk of cancer. There is lots of advice and links to information on lifestyle choices (diet, smoking, weight, alcohol, exercise and sun exposure) recommended in this App to help you reduce your risk. These lifestyle changes are choices that you can make and by doing so, you will reduce your risk of developing cancer. Even if you have been diagnosed with cancer, the advice remains the same. There is still a major benefit to improving your lifestyle. It has been shown that half of all cancers are preventable and 30% are preventable through lifestyle choices alone. Let’s look at how you can start to lower your risk of developing cancer. The lifestyle factors covered in this App are diet, smoking, weight, exercise, alcohol, and sun exposure. Just click on each icon and work your way through each section. With each one you will end up on an information page that has useful links and video clips.